1280 x 800, 16/32 bit; 1280 x 720, 16/32 bit; 1280 x 768, 16/32-bit; 1152 x 864, 16/32 bit; 1024 x 768, 16/32-bit; 800 x 600, 16/32 bits. ●This adapter will surely help you boost your work performance in the office in terms of multi-tasking. ●It gives you the ability to extend your working computer with split-screen display, mirroring display to increase work efficiency. This will enable you to RUN multiple applications on different screens. ●Supports Mirror Display. 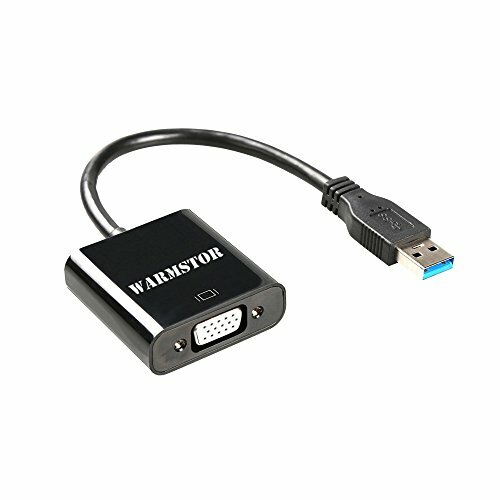 This VGA adapter is capable of syncing image with two displays so you can conveniently share and enjoy videos or slideshows on the big and high definition screens. ●USB 3.0 port highly recommended for smooth experience. Backward compatible with USB 2.0. Portable design. Small in size, works with all VGA displays. 1.This product is NOT a bi-directional adapter. It ONLY converts USB 3.0 to VGA! 2.Make sure your devices have USB3.0 port. USB3.0 supports: 1920*1080@60Hz (1080p max), USB2.0 ONLY supports: 800*600! 3.DO NOT support Mac! DO NOT support Surface Pro with ARM(Windows) processor! The USB 3.0 Graphic Adapter driver used to control the extra screen uses very little computer resource and offers a vast array of screen resolutions and color depths. Item work for most systems, including Windows 7 / 8 / 8.1 / Vista / 10, it comes with a CD for getting user guides and installing drivers. NOT compatible with Mac and Surface Pro 3. !! !IMPORTANT NOTES!!! : If your computer is Windows 10 System,please do not install the driver in the CD,it is not compatible with win10!You must please download and install a specialized driver by the link in the description!!! If you have any questions about this product by Warmstor, contact us by completing and submitting the form below. If you are looking for a specif part number, please include it with your message.